1. Ministers from OECD countries, joined by Ministers and representatives from Colombia, Latvia, Costa Rica and Lithuania, as well as from Brazil, China, India, Indonesia and South Africa, and during Session 7 from Argentina, Hong Kong (China), Kazakhstan, Morocco, Myanmar, Peru and Senegal, met under the Chairmanship of the Netherlands and the Vice-Chairmanship of the Czech Republic, France and Korea, from 3-4 June 2015, under the title “Unlocking Investment for Sustainable Growth and Jobs”. 2. After introductory remarks by the Secretary-General, the Prime Minister of the Netherlands, Mr. Mark Rutte, delivered the keynote speech of the Ministerial Council Meeting (MCM), underlining the critical importance of an investment-enabling environment and innovation, structural reforms and reducing policy-related uncertainty, while keeping a close eye on sustainability. MCM discussions were informed by the high-level dialogue “A view from the top” (public session), held between the President of France, Mr. François Hollande, the Prime Minister of the Netherlands, Mr. Mark Rutte, and the Secretary-General. 3. Ministers welcomed the gradual strengthening of the global economic outlook – driven by supportive monetary conditions and tailwinds from low oil prices – while recognising the heterogeneity of growth performance. They agreed that more still needs to be done to improve the performance of the global economy. Ministers stressed the key role of investment, not only to sustain the cyclical recovery, but also to raise productivity in the medium-to-long term and to support labour markets, contributing to broader economic, social and environmental goals. Some Ministers recognised the need to manage expectations about whether the investment rate in some countries may return to pre-crisis levels. In support of productive investment and sustained growth, they advocated more balanced policy packages with fiscal, and, especially, structural policies providing synergistic and reinforcing support for monetary policy. Some Ministers highlighted the potential side effects. They called on the OECD to build on its quantification work to better assess the implementation and impact of structural reforms, including in the context of the G20 National Growth Strategies, and to provide governments with evidence to advocate more ambitious reforms. 4. During a first high-level panel, Ministers underscored the importance of implementing targeted structural reforms, linking them to restoring public confidence. They agreed that we have not fully exited the crisis and stressed the need to move forward in a co-ordinated manner. On investment, Ministers recognised the strong relevance of making better use of available (institutional) funds, existing knowledge (for instance through public-private partnerships) and ideas (such as innovation-friendly regulation). They acknowledged that while it is the task of businesses to make productive investment decisions, governments should focus on providing a stable, predictable, and enabling environment, and on fostering better regulation and more efficient public spending. Some Ministers expressed concern about protectionism and highlighted the need to foster open markets. 5. During the second high-level panel, Ministers discussed how investing in human capital and knowledge-based capital (KBC) can promote employment, productivity and growth, including through better education and skills and by addressing labour market gaps. They recognised that continued improvements in human capital will be required not only to support individual opportunity and social cohesion, but also to drive economic growth, which has become increasingly reliant on innovation-driven gains in multifactor productivity. Ministers noted that persistent skills mismatches bring considerable costs and that efforts to reduce them can and should be scaled up, better anticipating and responding to employers’ changing skills needs. They acknowledged the importance of the distributional aspects of income and wealth, and discussed the importance of assessing multidimensional living standards to account for both income and non-income related outcomes that matter for people’s well-being. In this context, they also stressed the relevance of indicators beyond GDP, including OECD work on How’s Life? and Green Growth Indicators. 6. Ministers welcomed the renewal of the mandate of Mr. Angel Gurría as Secretary-General of the OECD from 1 June 2016 until 31 May 2021. They expressed appreciation for his leadership and efforts to strengthen the relevance and impact of the OECD, as well as his role in proposing new initiatives, including his Strategic Orientations, to promote “Better Policies for Better Lives”. 7. Ministers welcomed the conducted Scenario-Based Policy Discussion - one of the new elements of the 2015 Ministerial Council Meeting - which allowed Ministers to use “what if” scenarios and megatrends as useful tool to look at possible futures and discuss potential policy implications. Ministers expressed strong interest in the OECD continuing to develop its forward-looking tools for long-range analysis as well as further strengthening its strategic foresight capacity. In this context, Ministers welcomed the New Approaches to Economic Challenges (NAEC) initiative, stressing the importance of rapidly mainstreaming lessons learned across the Organisation, including in some of its flagship publications, while continuing to deliver results and to inform the Organisation’s work. Ministers welcomed the update report on the All on Board for Inclusive Growth initiative. They encouraged the OECD to exploit all opportunities for the widest possible dissemination of this work, including through knowledge sharing platforms. 8. Ministers discussed the multi-faceted role of investment in promoting robust, inclusive, sustainable and resilient economic growth. They focused on the linkages between investment and inclusive growth, innovation, skills and Responsible Business Conduct (RBC), and how investment is supported by a conducive business climate. They welcomed the investment focus of the OECD Economic Outlook (June) and the forthcoming OECD Business and Finance Outlook, as important inputs to the policy debate. Ministers noted the Organisation’s ongoing work to advance benchmark definitions of investment, identifying what constitutes productive and value-added investment, and on the role of investment in Global Value Chains (GVCs) and the economics of investment flows, including the quantifying the impact of Special Purpose Entities and of Mergers & Acquisitions. 9. Ministers encouraged the dissemination, notably at the Financing for Development conference in Addis Ababa in July 2015, of the updated Policy Framework for Investment (PFI), as an important tool for designing, implementing and monitoring investment climate reforms, as well as for development co-operation programmes to foster investment at home and abroad. They welcomed the adoption of the Recommendation of the Council on the Policy Framework for Investment to this effect. Ministers asked the OECD to develop PFI indicators to help inform countries’ progress in adopting policy reforms and to further develop appropriate methodologies, including stakeholder consultations and close coordination with other international organisations, to better assess the impact of policy recommendations based on the PFI. They agreed that the PFI was a key contribution to the post-2015 development agenda. Ministers also encouraged the OECD to provide further analysis of governance mechanisms for promoting public investment. 10. SMEs, innovative firms and start-ups were identified by Ministers as important drivers of growth, innovation, dynamism and jobs. They called for further policy action to improve their access to a diverse set of bank and non-bank finance instruments across firms’ life cycles; recognised the importance of infrastructure investment to support demand and employment while boosting productivity and growth; and called on the Organisation to continue its work to improve the governance framework for infrastructure investment. The OECD’s work on long-term investment, green investment and national investment strategies for the G20 was also welcomed, with Ministers also highlighting the importance of ensuring a sound regulatory framework, promoting fair competition and levelling the playing field between private firms and state-owned enterprises. 11. Ministers agreed to increase international cooperation in the area of international investment in light of the proliferation and complexity of bilateral agreements and their updates. They recognised the need for joint efforts to share knowledge and best practices on investment, including on investor-state disputes. 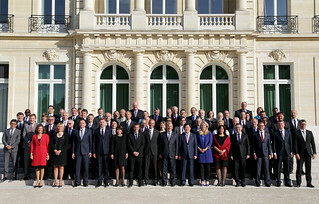 Given the current complex environment, dominated by more than 3000 investment treaties, Ministers discussed how the OECD could enhance the inter-governmental and multi-stakeholder dialogue on investment treaties and on the global investment environment through the Freedom of Investment Roundtable (FOI). Some of them recognised the need for a global framework for public sector investment. They suggested that the OECD explore options to make this process more inclusive, including by launching a knowledge-sharing platform on investment issues, involving emerging economies and cooperating with other international organisations. Ministers called on the OECD to analyse how sustainability and Responsible Business Conduct (RBC) can be promoted through trade and investment. They asked the OECD to deliver a progress update on these issues at the December 2015 Global Strategy Group (GSG) meeting and to report to the MCM 2016. 12. Ministers suggested that additional public funding for R&D should focus on effectively leveraging private investment, facilitating the development of innovative firms and start-ups and should be increasingly oriented towards global challenges. In this context, they welcomed the updated Innovation Strategy and the focus on evidence-based innovation policy, also underlining the growing importance of investment in intangibles. Ministers called on the OECD to support enhanced collaboration between the public sector, private sector and research institutions. They agreed that successful deployment of new technologies and business models (e.g. based on big data and sensors, robotics, nanotechnology) requires innovation-friendly regulation consistent with a digital and data driven economy, complemented by a supportive business climate, and better use of existing knowledge in order to provide innovative solutions for global challenges. One example mentioned of innovation policies to foster productivity was the importance of ensuring a well-functioning and modernised intellectual property rights (IPR) system, compatible with the fast-changing nature of innovation today, as well as new technological and cross-border developments. Some Ministers stressed the need to address the issues of excess capacity in certain industries. 13. Innovation is key to boosting long-term productivity and more needs to be done to close the gap in productivity growth between firms at the global technology frontier and others including by investing in and shaping an efficient system of knowledge creation and diffusion. Ministers highlighted in this respect both the importance of exposure to international trade and FDI and Global Value Chains (GVCs), and the capacity and incentives for the most dynamic firms in an economy to upscale, combined with the ease with which resources are reallocated away from less productive firms. Ministers acknowledged that the fast pace of technological change is creating opportunities for new, more sustainable production modes. They strongly supported the OECD’s work on the “Next Production Revolution” and asked that this initiative also incorporates the analysis of changes in manufacturing and services, to better understand the digital economy and its impact on growth and jobs. Ministers encouraged the OECD to deliver an update on this work at the meeting of the Committee for Scientific and Technological Policy (CSTP) at Ministerial level in October 2015 and to report to the next MCM. 14. Ministers stressed the importance of investing in human capital and recommended that the Skills Strategy be revised to specifically address issues arising from technology-induced change and from Global Value Chains (GVCs). They called on the OECD to look at how countries can adapt to the expected labour market demands. They stressed that continued improvements in human capital will be required not only to support individual opportunities and social cohesion, but also to drive economic growth. 15. Ministers welcomed further OECD work on inclusiveness and on inequality of income, wealth, health and other opportunities, and noted ongoing initiatives targeting under-represented groups, including gender equality, youth employment, ageing society and the economic integration of migrants and their families. Ministers noted the importance of policies to boost employment and provide access to quality jobs, as well as to high-quality early childhood care and education; and the importance of strong school systems, life-long learning and vocational training strategies to ensure that people have the needed skills. Reflecting on the importance of promoting learning societies that ensure people develop a broad range of skills, Ministers considered the role of work-based learning in vocational education and training, as well as in university education, and agreed on the need to tackle skills mismatches. 16. Ministers encouraged the OECD to develop options for widening adherence to the Guidelines for Multinational Enterprises (MNEs) and called for the system of National Contact Points (NCPs) to be strengthened, including through voluntary peer reviews and the exchange of best practices. They also welcomed the Organisation’s support for the work of the German G7 Presidency on Responsible Business Conduct (RBC). 17. On tax transparency, Ministers emphasised the need to level the playing field and avoid harmful tax competition between countries. They called for a commitment to the rapid implementation of the new Automatic Exchange of Information (AEOI) common reporting standard, and encouraged the widest possible adherence to the Multilateral Competent Authority Agreement on the Automatic Exchange of Financial Account Information (MCAA). Ministers welcomed recent signings of the MCAA by Australia, Canada, Chile, Costa Rica, El Salvador, India, Indonesia and New Zealand, which has brought the total number of signatories to 61. They looked forward to the successful delivery of the OECD/G20 Base Erosion and Profit Shifting (BEPS) initiative by end-2015 and to the adoption of mechanisms to ensure implementation and follow up, as well as OECD support to all countries in this regard. In this regard, Ministers welcomed the commencement of negotiations of a multilateral instrument to implement BEPS treaty-related measures, open to all countries, which already involves the participation of over 80 countries on an equal footing, including emerging and developing countries. Ministers also called for the broadening of the OECD Tax Inspectors Without Borders initiative. 18. Recalling the 2014 Ministerial Statement on Climate Change and committed to an ambitious, comprehensive agreement at the COP21 and its implementation thereafter. Ministers discussed how to strengthen an enabling environment to stimulate and to facilitate the transition to a low-carbon economy. They called on the OECD to continue supporting these international and national climate change efforts, among others, by developing mechanisms to evaluate and assess progress and policies. Furthermore, they stressed the importance of ensuring that all actors are mobilised to support climate action and the social dimension of climate and green investment policies are addressed, including through the Addis Finance for Development Conference, and the adoption of the SDGs. 20. Ministers recognised that in order to support the transition to a Low-Carbon Climate-Resilient (LCCR) economy, more financial resources can and should be mobilised by targeted taxation and by using public funds to leverage a much greater level of private climate finance and investment for infrastructure in urban, transportation, land use, water and energy systems. This calls for governments to promote an enabling environment - including financial stability- supported by carefully designed coherent, transparent and predictable policies, and complemented by economic incentives and market-based approaches, including carbon and water pricing. Ministers acknowledged the need to measure and track progress towards the developed countries’ goal of mobilising USD 100 billion per year by 2020 to address the needs of developing countries for the transition to a LCCR economy. Ministers called upon the OECD to continue the work on effective policies to tackle climate change, financing the transition, and the role of technology in addressing this global challenge. 21. Given the crucial role of water in both climate change adaptation and the water-food-energy nexus, Ministers discussed how good water governance can help strengthen resilience and disaster risk management, as well as secure a sufficient supply of fresh water for future generations in a cost-effective and efficient way. Ministers shared the view that a pro-active, adaptive, long-term strategy, taking an integrated/cross-sectoral approach and engaging multiple stakeholders, is key. In light of this, Ministers welcomed the OECD Principles on Water Governance and invited the OECD to develop a Recommendation on water that updates and consolidates existing policy guidance on water. They also noted the OECD’s support for G20 work on energy and food security, and encouraged further efforts in this regard. 22. Finally, Ministers welcomed the OECD’s work on Green Growth and asked the OECD to continue supporting countries’ efforts to better target green growth policies. 23. Ministers extensively discussed the increasing links between trade, investment and development, agreeing to further explore their synergies and looking forward to further OECD work on the effects of Global Value Chains (GVCs) on labour conditions and skills, the role of RBC and promoting sustainability via trade and investment agreements. They recognised that trade and investment are crucial for a successful implementation of the post-2015 development agenda, the PFI being a welcome framework to mobilise investment. Ministers acknowledged the importance of private investment and good governance for development, agreeing that more and better business and investment is needed for a successful implementation of the Post-2015 Development agenda. Ministers stressed the contribution the OECD can make to an ambitious Post-2015 Development agenda for instance by fostering policy coherence for sustainable development, but also by supporting developing countries’ tax capacities through the Tax & Development programme. 24. Drawing on evidence from the OECD Trade in Value Added (TiVA), Global Value Chains (GVCs), Trade Facilitation Indicators (TFIs), the Service Trade Restrictions Index (STRI), as well as on countries’ own experiences, Ministers acknowledged the relevance of trade openness for sustained and inclusive growth, prosperity and job creation. Ministers recognised that the OECD plays an important role in making the costs of trade barriers visible and called on the OECD to deepen its analysis on trade and investment restrictions, and welcomed the Organisation’s efforts to support coordinated policy action on these issues. 25. Ministers identified the existence of important barriers to trade, including inefficient customs procedures, long-standing obstacles to agricultural and manufacturing trade, services trade restrictions, and explicit and implicit restrictions on cross-border investment, as well as the prevalence of ‘behind the border’ barriers to trade. To maximise the benefits from trade and investment, Ministers highlighted the importance of removing trade and investment barriers and reaffirmed their ‘standstill and rollback’ commitments to resist all forms protectionism. They also invited the Organisation to further explore TiVA-GVC issues, including their relationships to GDP and trade; the ‘servification’ of manufacturing; and the impact on employment and labour conditions, as well as measures to encourage a sustainable participation of SMEs and firms from developing countries. Ministers also encouraged the OECD to deepen its analysis on the role of Responsible Business Conduct (RBC), including in trade and investment agreements in ensuring that the benefits of GVC participation are widely shared. 26. There was support for regional trade agreements, as well as bilateral and plurilateral initiatives, in parallel with multilateral Doha Development Round negotiations at the WTO, and for the removal of barriers to investment. Ministers acknowledged that implementing Bali and finalising Doha is crucial and that new approaches are needed to answer the changes (GVCs, importance of services, digital economy) we see in global market. They invited the Organisation to assess the impact of the use of RBC clauses in trade and investment agreements and their alignment with the post-2015 development agenda, and welcomed the OECD’s continued support for regional integration efforts. Ministers encouraged OECD contributions to the 10th WTO Ministerial Conference in Nairobi and called for the timely ratification and implementation of the WTO Trade Facilitation Agreement and of all other elements of the Bali package. 27. Ministers called for stronger efforts to eradicate poverty and precipitate a transformational shift towards a more sustainable future. In this regard, they welcomed the OECD contributions to the Third International Conference on Financing for Development in Addis Ababa, in July, and to the UN Summit to adopt the Post-2015 Development Agenda in September 2015, in New York. More broadly they called on the OECD to support governments’ efforts to implement and monitor the achievement of the Sustainable Development Goals (SDGs), including by sharing its evidence-based tools and by further enriching its platforms for dialogue. In particular, they welcomed ongoing OECD work on domestic resource mobilisation; investment, including a broader use of the Policy Framework for Investment (PFI) as a valuable tool for promoting the right policy mix to spur responsible investment and support inclusive growth; and the Organisation’s efforts to better measure sustainable development. 28. Ministers welcomed the role played by the OECD Development Centre as a platform for the exchange of substantive knowledge and policy experiences among OECD and non-OECD countries. They also called on the OECD to further leverage the Global Partnership for Effective Development Co-operation and other partnerships in support of the post-2015 agenda. 29. Ministers acknowledged the continued importance of Policy Coherence for Sustainable Development. They stressed that promoting RBC in this context enhances the positive contribution businesses can make to economic, environmental, and social progress. They underscored the importance of outreach in respect of the MNE guidelines in the context of the participation of companies from an ever-growing range of countries in international markets. 30. Ministers, recognising the important contribution made by Official Development Assistance, reaffirmed their respective commitments. This includes the commitment to allocate a larger share of total ODA to countries most in need and to reverse the declining trend of ODA to least developed countries (LDCs). They welcomed the recent progress by the Development Assistance Committee (DAC) on the measurement of Total Official Support for Sustainable Development (TOSSD). 31. Ministers welcomed the OECD developing a strategic roadmap setting out a number of actions in which the Organisation can support for the implementation of the post-2015 agenda, including the updating of the OECD Strategy on Development. 32. At the end of the closing session, Ministers adopted the 2015 Ministerial Council Meeting Statement. They strongly encouraged the OECD to deepen its co-operation with Key Partner countries and noted the recent agreements and joint work plans with China, Brazil and Indonesia. They welcomed the OECD’s contributions to international fora, in particular the G20, G7 and APEC, on issues including strong and inclusive growth, employment, gender equality and skills, trade, investment, taxation, anti-corruption, energy and entrepreneurship, among others. In this respect, they encouraged the Organisation to continue to support successive G20 and G7 presidencies and further leverage OECD work to inform international cooperation efforts. 33. Ministers welcomed the progress made by Colombia and Latvia in their accession processes, as well as the opening of accession discussions with Costa Rica and Lithuania. They recalled that applications for accession are considered individually. Members also discussed the possibility of creating an intermediate status for certain Partner countries that would allow them to associate themselves more fully to key OECD activities and instruments. They noted the progress achieved through the Southeast Asia Regional Programme (SEARP). Ministers encouraged the OECD to further enrich the SEARP, in cooperation with ASEAN Partners and regional organisations, such as the Economic Research Institute for ASEAN and East Asia (ERIA). They also noted the launching of Country Programmes with Kazakhstan, Morocco and Peru; and their support for the renewal of the mandates of the MENA-OECD and the Eurasia Competitiveness programmes. They invited the OECD to consolidate its activities with Latin American and the Caribbean region and to consider the establishment of a regional programme to be launched at the MCM 2016. Ministers asked the OECD to strengthen its regional programme with Southeast Europe, to continue cooperating with Ukraine, and to further develop its work with Africa. 34. Ministers agreed that Chile would chair the Ministerial Council Meeting in 2016. They strongly welcomed the innovative elements of the 2015 Ministerial Council Meeting under the Chairmanship of the Netherlands (notably a more focused agenda, interactive breakout groups, a scenario-based policy discussion and closer links to the OECD Forum). They called on the Secretariat to continue exploring these innovative elements in future Ministerial Council Meetings.